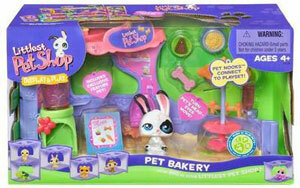 Description Of Item: Set up the DISPLAY & PLAY Pet Bakery playset and all of your littlest pets (one pet included, other pets sold separately) can meet for treats! One busy bunny is here to put out a menu, dish out the goodies, and serve up a smile! Turn this bunny?s head and its eyes move! Playset comes with exclusive feature pet and accessories. Pet contains magnets.